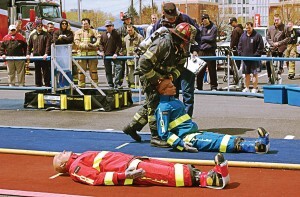 this year: Sign-up is open online through www.fdic.com. exposition in the U.S., then 2014 will be a great year to take advantage of the jam-packed number of career-building education and training opportunities. If you’ve been to fdic before, though, then encouragement is hardly needed. 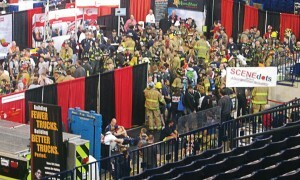 The 86th year of the conference holds everything that the firefighting professional, from chief and EMT to rank and file, have come to expect: hundreds of exhibitors; over 200 educational sessions that run the gamut from flashover to unusual tactical rescues; onsite training; competition; and even time for catching up and for having fun. Last year over 30,000 attendees from 55 countries spent the five days of the conference doing just that, with 96 percent saying at the close that they intended to return in 2014. Things get underway Monday, April 7, at the Indiana Convention Center and Lucas Oil Stadium in Indianapolis, Ind. Hands-on training workshops take up most of the first two days, and on Wednesday the education portion of the program picks up and continues through Friday. The exhibit hall will open daily Thursday afternoon through Saturday afternoon. When classes are over, plan to participate in the seventh annual fdic Courage and Valor Run; or check out the Indianapolis 500 Experience located at Lucas Oil Stadium. Also during the conference, the Indy 500 Ballroom will host the annual National Honor Guard competition. Spectators are welcome. Registration for fdic 2014 is being accepted online at www.fdic.com/register, or call (888) 299-8016. Shuttle service from 17 Indianapolis-area hotels to the downtown location will make travel to the site easy.